The last time I did Fran was in January at LAX Crossfit. It was the first time I did her with bandless kipping pull ups. Yesterday I set a new personal record, beating my old time my 1:13. I'm happy. 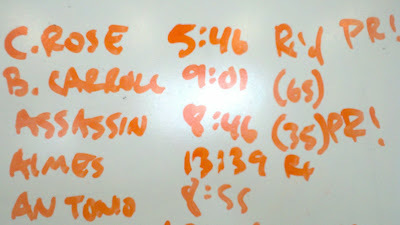 I did the first set of 21 thrusters straight through, which really really really gassed me. Diso gave me some really helpful pointers on thrusters before the clock started and I felt it helped a lot in my technique and efficiency. After collapsing on the floor, I had an involuntary upchuck gag. Nothing came up, but it's still no fun to dry heave.